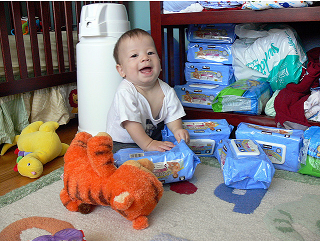 I prefer to use Puffs facial tissues for my baby's bottom rather than the homemade baby wipes to save money. I have a squirt bottle filled with 2-3 tablespoons baby wash, 2-3 tablespoons baby oil and water. I squirt his bottom, then wipe with the dry tissues. 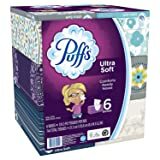 Facial tissues are softer and much less expensive than paper towels - and I don't have to bother with cutting the paper towels in half (which can get quite bothersome). Thanks to J. Buffett for this Frugal Baby Tip! I save even more by using wash clothes. They go right in the diaper pail and are washed with the diapers.